How to know your Pearly Class from your Edwardian launch. At Hobbs of Henley we’ve been renting out boats to day trippers for nearly 150 years, so we know how important it is to have boats that can meet a variety of needs. Whether you want to take a step back in time to the Edwardian era and enjoy a picnic with a group of friends, take your family for an hour-long spin in our smaller Pearly class launches or have some fun in a traditional rowing boat, we have the self-drive boat hire experience for you. We had a chat with the Managing Director, Jonathan Hobbs, to learn more. Q: What exactly is an Edwardian Launch? A: The name Edwardian launch relates to the look, comfort and style of the boat, distinguished by it’s cover and traditional outfitting. They are perfect for family outings or transport to riverside restaurants and hotels and can be hired as chauffeured launches by the hour if you want to focus your attention on your guests. Q: Which boat would you recommend for luxury-loving visitors? A: Olympic launches are ideal as they’ll definitely turn heads at any restaurant you care to visit and are perfect for entertaining clients during the Royal Henley Regatta and Festival. If you have 10 or fewer people to accommodate, they be hired with a chauffeur and as with most of our other boats, we can arrange for lunch or afternoon tea picnic hampers to make your day even more memorable. Q: How about if you feel like going back to basics, are there any for those who want to try manual rowing? A: If you want to prove mastery of man (or woman!) over the elements – or even if you just like the idea of being more environmentally friendly and going with the flow – our fibre glass skiffs, or rowing boats, are the simplest way to discover the river around Henley. Rowing (or sculling, as it’s one person using two oars) can be a great way to work off a big lunch or build up an appetite, but as you control the pace and direction of travel you can take it as leisurely as you want. They are suitable for up to three or five people to enjoy the river as Mother Nature intended. Q: Are any of your boats on offer considered ‘exclusive’ to The Thames? A: Yes, ‘Lady Michelle’ and ‘Isabella’, our Antaris class launches are. These stylish boats joined our fleet in 2015 and 2017 and are the only Antaris’s available to hire on the Thames. They are stunning Dutch made sloop 570’s and are suited to parties of up to 6 people and they are fully convertible. Also the Linssen boats, Jacqueline and Midsomer, we have on offer are brought over from Holland too and are exclusive to our royal river- these are available on a weekend or weekly basis. You will be completely self-contained as you explore such sights as Windsor Castle, Runnymede and Hampton Court Palace, or head north to the famous University city of Oxford and the Cotswolds… giving you the options and freedom to do so in unparalleled comfort. Q: How about if it’s your first time hiring a boat, is there anything you need to know ahead of time? 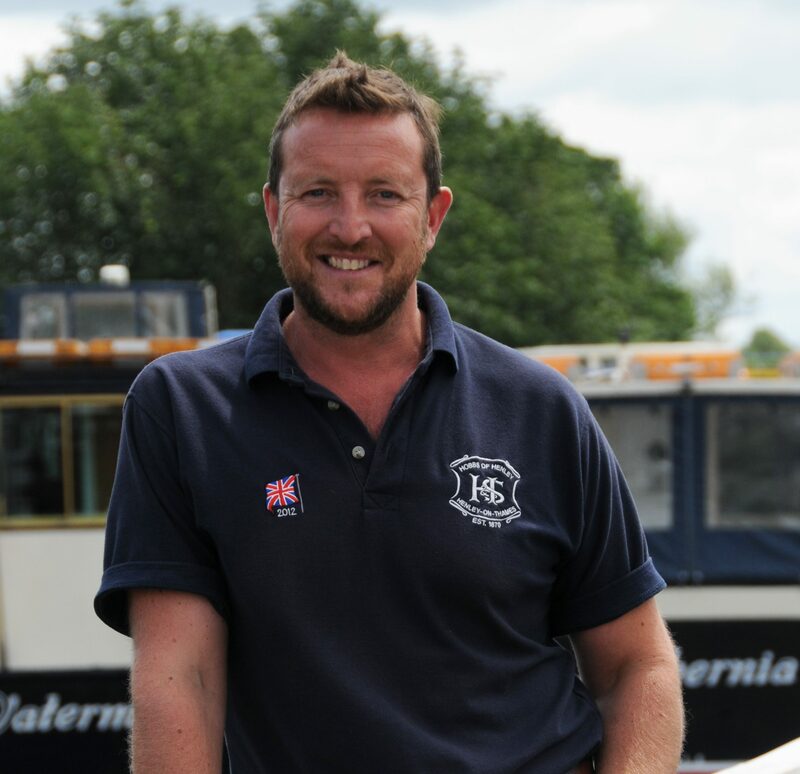 A: If you’re thinking of renting a motor boat for the first time, there’s no need to worry; one of our boat yard staff will instruct you on how to drive the boat and ensure that you are competent at everything, including steering, before you set off on your adventure down the Thames. We have a choice of 10 self-drive Pilot Class launches which are available for hire by the day or hour. They’re a more affordable way of messing about on the river and can still be combined with one of our supplier’s picnic hampers for getting away from it all up or downriver. Q: What about if you only have a spare hour to experience Hobbs of Henley? A: If you’re looking for something a little simpler for you and up to three friends or family, our Pearly class launches will be the perfect option. Easy to drive and navigate, these boats are available for rent for an hour at a time on a ‘turn up and hire’ basis. With thirteen of these fun little boats in our fleet they offer a more affordable option for families looking to enjoy a quick spin on the river!